If you’ve been searching for homes to stay in for your upcoming San Felipe vacation, you have probably heard about Pete’s Camp. This charming, safe, family-friendly community is home to multiple vacation rentals and a newly renovated restaurant and bar. It is here that you’ll find this gorgeous three-bedroom community house for rent that is a minute walk from the beach. When you arrive at this rental, it will quickly become obvious why it's called "Family Beach Getaway Home in Pete's Camp." This vacation home has everything the modern family needs for a relaxing beach vacation. There is a fully furnished kitchen with updated amenities such as a refrigerator, stove, microwave, and dishwasher. A large center island serves as a snack bar and extra counter space. Three trendy bar stools complete this snack area for a casual and comfortable spot to relax in the kitchen. All of the cookware and utensils are included in this home. So if you are in the mood to prepare some home cooked meals, simply head in to town to one of the grocery stores, pick up supplies and know that you will have all the cooking utensils at your disposals. Some of the grocery stores have outdoor barbeque stands where your meat can be prepared for you if you so wish. Right next to the kitchen is a formal dining area. This room has a long rectangular table and seating for six. Directly off of the dining area is a large living room. This common area has flat screen TV and DVD player, so you can watch all of your favorite movies as a family. Satellite TV is included and connected tot he TV. There is a large sofa, plush love seat, and comfortable armchair, so everyone can find their favorite spot in the room. Tucked away in the corner of this living room is a single, twin size bed. This extra bed provides additional sleeping accommodations without taking up any living space. This unique vacation rental started out as a one-bedroom trailer. Over time, the living room, kitchen, and two additional bedrooms were creatively added to be become an eclectic construction. This home is a favorite with renters who have stayed here before with many repeat rentals. The first bedroom has a California King size bed and beautiful armoire to hold your personal belongings. The second bedroom has a full-size bed and a twin size bed. The third bedroom has a full-size bed. There are two bathrooms in this charming home, and if you’re thinking about bringing your four-legged family members, this home is pet-friendly. 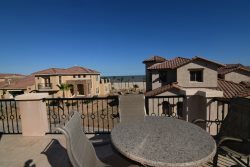 In the mornings, take a cup of coffee up to the roof top patio and watch the sleepy town of San Felipe wake up and Sea of Cortez activity. The rooftop patio is shaded and had plenty of chairs and a large table to sit around, so everyone can enjoy the space comfortably. Or, after a day of fun in the sun, enjoy the views of the Gulf of California with a cool drink in your hand under the shade on the private patio. More than likely, you’ll make a few friends during your stay, as the community is very welcoming and friendly, and there is always someone outside to say hello to! The private first-floor patio has a stainless steel BBQ, so you can throw some burgers or chicken on the grill and enjoy a tasty dinner in the shade. The unique architecture of this home really adds to the San Felipe vacation experience. The combination of stone, brick, and Spanish tile brings this home together is a comfortable and stylish way. The rooftop patio is red, the kitchen has a hint of green and the dining area sports subtle pops of orange along with authentic Mexican décor. This home really creates an atmosphere that makes you feel like you’re on vacation, but right at home, all at the same time. The beach in Pete's Camp is a haven for water recreational activities due to the calm nature of the beach. Bring all your water toys; floaters, kayaks, canoe, standup paddle boards, body boards. Popular at the beach is to ride the banana and sombrero inflatables which are towed by a speed boat. Bring your Go Pro as you will be catching amazing vacation memories. If you plan to go fishing, let us know in advance so we can reserve a boat for you. Our recommendation is to do a fishing and sightseeing combo trip to Konsag Island located of the coast of San Felipe. An 18-hole championship golf course is located next door to Pete's Camp, so if you are a golfer, you will be delighted to know that this is an option for you during your vacation. It's cost $50 for a round of golf and this includes the golf cart. One big plus with this rental is the nearby restaurant which serves breakfast, lunch and diner. And across from the restaurant is a open-air Tiki Bar with a friendly bartender. Free WiFi is available for guest use in the restaurant and by the bar. Bath towels provided - one per guest. Please bring your own beach towels.